Google has released a beta of a “Google Cloud Connect for Microsoft Office” plugin for Google Apps for Business users, that allows them to save their Microsoft Office files automatically to Google Docs. Currently it is available to select beta testers only. With Cloud Connect, people can continue to use the familiar Office interface, while reaping the benefits of web-based collaboration that Google Docs. Users of Office 2003, 2007 and 2010 can sync their Office documents to the Google cloud, without ever leaving Office. 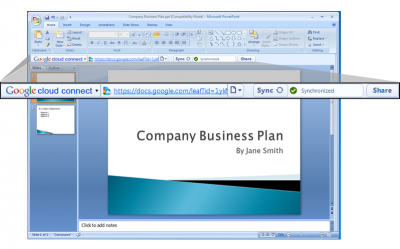 Once synced, documents are backed-up, given a unique URL, and can be accessed from anywhere, including mobile devices, at any time through Google Docs. Once in the Google cloud, documents can be easily shared and even simultaneously edited by multiple people, from right within Office. A full revision history is kept as the files are edited, and users can revert to earlier versions in one click. These are all features that Google Docs users already have but Google has now brought this to Microsoft Office too via its Google Cloud Connect for Microsoft Office plugin.